MICSA is package for the identification of transcription factor binding sites in ChIP-Seq data developed by the Computational Systems Biology of Cancer group at the Bioinformatics Laboratory of Institut Curie (Paris). Cite: Boeva V, Surdez D, Guillon N, Tirode F, Fejes AP, Delattre O, Barillot E. De novo motif identification improves the accuracy of predicting transcription factor binding sites in ChIP-Seq data analysis. Nucleic Acids Res. 2010 Jun 1;38(11):e126. Epub 2010 Apr 7. Download the article: HTML, PDF. Download and install the latest version of MEME from the MEME website. MEME is free only for non-commercial use. Please check the MEME license before using. Add the directory with meme.bin ("meme_your_version\src"?) to your PATH. or run MICSA pipeline in command line. 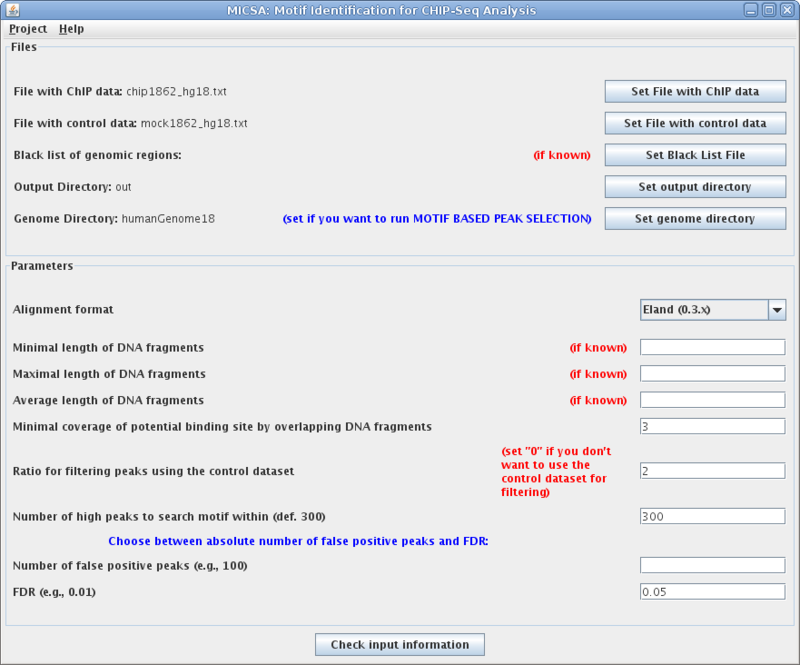 File with ChIP data: chip1862_hg18.txt file with ChIP-Seq data for NRSF, aligned by Eland to the Human Genome assembly 18 (Mar.2006). 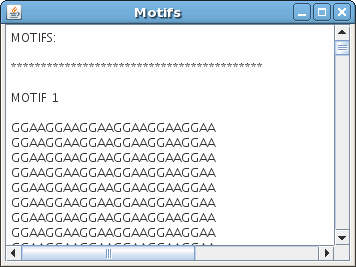 File with control data: mock1862_hg18.txt file with control data, aligned by Eland to the Human Genome assembly 18 (Mar.2006). Both files can be downloaded here. Black list of genomic regions: hg18_masked_Centr (Download hg18_masked_Centr) file with positions of pericentromeric repeats (e.g., Alpha-satellites) in hg18 downloaded from UCSC Genome Browser. You can use other files for masking. For example: hg18 satellites , hg18 whole pericentromeric and heterochomatin regions. Output Directory select your output directory. If the specified directory does not exist, it will be created. Genome Directory: hg18 directory with human genome files. The human genome (assembly Mar.2006) can be downloaded here. Alignment format - Eland (0.3.x) here you need to specify the alignment format for your data. The NRSF data are in format Eland. Minimal, maximal and average length of DNA fragment optional parameters. Set them if your know the length distribution of the DNA fragments you sequenced. Minimal coverage of potential binding site by overlapping DNA fragments set how many overlapping DNA fragments you need to keep a peak. This value is roughly equal to the minimal number of mapped DNA reads in a window (the minimal value is 3). 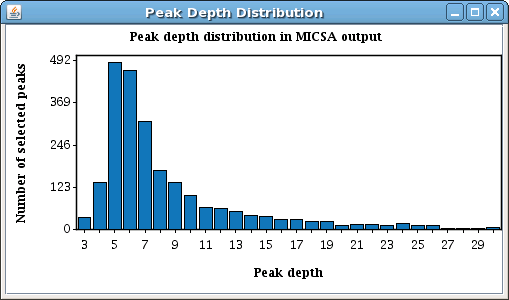 Ratio for filtering peaks using the control data in the case when a peak in the ChIP data overlaps with a peak in the control data, the former will be discarded if the height of peak from ChIP data devided by the hight of peak in the control data is smaller than the specified ratio. Number of false positive peaks Number of false peaks you allow in the output. With 120 false positives you can find about 5000 peaks. Alternatively, you can specify a false discovery rate, which is the ratio between the evaluated number of false positive binding sites and the total number of predicted binding sites. Read the FindPeaks Manual for more options. FindPeaks can output either the entire data track or provide the data track split by chromosome. If you have a large dataset, it is best to upload only chromosomes that you are interested in. UCSC genome browser does not accept large files, so attempting to load an excessively large wig file may cause the upload to fail altogether. It is suggested that you use the “by-chromosome” option, triggered by the “-one_per” flag on the command line for FindPeaks. UCSC Genome Browser sessions will expire after about 3 days of inactivity, however, you may keep a session alive longer by "refreshing" the current session (by hitting "referesh" button or by zooming in or out). java -jar -Xmx2G PATH_TO_MICSA/micsa.jar -name micsaTest -f wig/chip_triangle_standard.peaks -n 50 -o "outputDir" -l "wig/FindPeaksSummary.txt" -g "PATH/humanGenome" -w "wig/chip_triangle_standard.wig.gz"
Download ChIP and control data for EWS-FLI1. 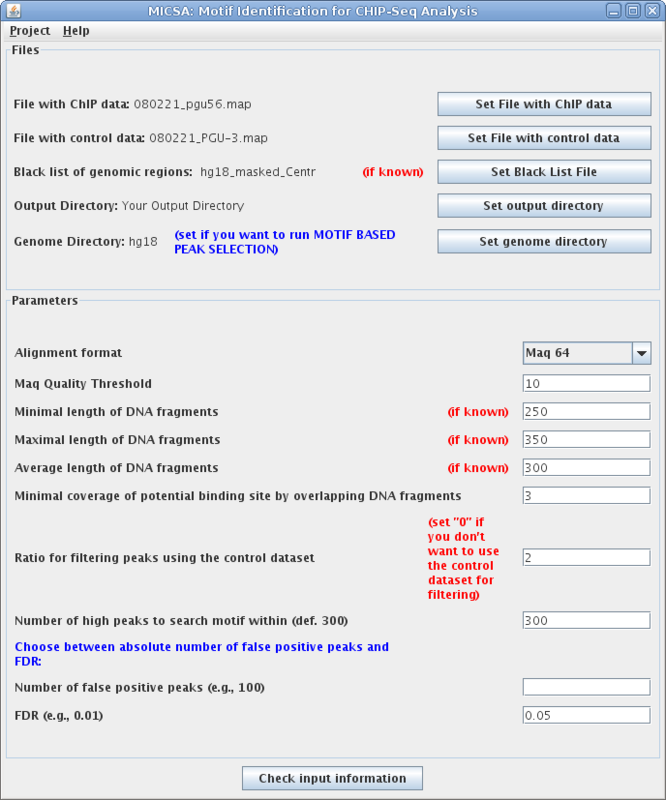 File with ChIP data: 080221_pgu56.map File with ChIP-Seq data for EWS-FLI1 (download), aligned by Maq to the Human Genome assembly 18 (Mar.2006). File with control data: 080221_PGU-3.txt File with control data ( download), aligned by Maq to the Human Genome assembly 18 (Mar.2006). Alignment format - Maq 64 Here you need to specify the alignment format for your data. The EWS-FLI1 data are in format Maq 64. Number of false positive peaks Leave blank if you want to use FDR instead. FDR False discovery rate you allow in the output. Score is small for high confidence peaks.